Statistics tell us the risk of being killed by an asteroid is greater than being killed in a plane crash - but this statement is misleading. Every year there are millions of plane flights, and every year about 100 people die in plane crashes. The odds of getting on an airplane in any year are high, but the odds of being on a fatal flight are low. 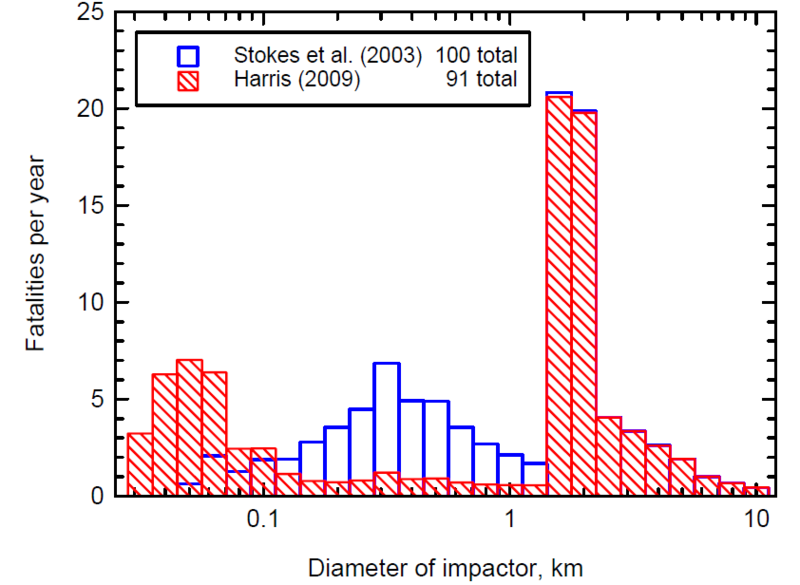 Asteroid impact statistics are different. Asteroids range in size from daily showers of gravel that burn up entering the Earth's atmosphere to the mountain-sized rocks that crash to Earth once every few million years. Compare the effects of both and the big rocks are deadlier; their devastation outweighs their infrequency. The average number of deaths from an asteroid impact is estimated at about 1,000 per year but that figure relates to a billion people killed by one massive asteroid impact every few million years, rather than 1,000 people dying from smaller impacts each year. We have no experience with asteroid fatalities (although the section on historical impacts may surprise you) but the bottom line is that "death by asteroid" is an extremely low risk, perhaps 10 times greater than dying from a shark attack, but lower than dying in an earthquake. Why worry about asteroids if the impact risk is small? The risk of a house fire is small but the investment in fire insurance to protect your house (and that of your neighbor) is also small. Simply stated, if your house burns down it can be dangerous, even deadly. This argument can be made to protect Earth against asteroid impacts. The impact risk is small, but if a dangerous asteroid is heading for Earth we should be prepared. The cost-savings of not building a warning system will be worthless if most of Earth's population dies because we failed to look for what is approaching. Remember that the dinosaurs and about 80 percent of life on the planet was wiped out by an asteroid impact 65 million years ago. But dinosaurs had brains the size of walnuts and no opposable thumbs to hit the space bar on a keyboard. Humans today have big brains, opposable thumbs and the technology to build a warning system to help save the planet from destruction. Why not make the effort? So how does ATLAS reduce the risk? While it's impossible to know of most natural disasters ahead of time, it is now possible to know in advance of an asteroid impact. Until 10 years ago, it was just not technically feasible to perform such a wide, deep, and fast search of the sky. Today's camera and computer technology have made it possible to scan the entire sky every night to discover incoming asteroids before they hit. In nerd-speak, Moore's law met the Universe and Moore's law won. The U.S. Congress responds to the asteroid impact threat. By 2020, it ought to be possible to find at least 90 percent of asteroids, diameter 140 meters (500 feet) or larger (100 megaton or more worth of impact energy) that come close to the Earth. This could be accomplished by immediate, dedicated ground-based surveys or by a satellite that looks for the thermal glow of asteroids. The cost would be around $1 billion. NASA also discussed ideas on how to deflect an incoming asteroid. Deflection methods depend strongly on finding a deadly asteroid long before the predicted impact time since the feeble push we could exert to move an asteroid would take a long time, and because of the lengthy process involved to mount such a mission. This means that to find an Earth-impacting asteroid early enough to divert it, scientists should expect it to be at any random place in the Solar System, and at a distance comparable to that of the Earth from the Sun (about 93 million miles). Time, distance, and because a 140-meter (500-foot) diameter asteroid is really very dim and small in the vastness of the Solar System, are what make it so difficult and expensive to determine the danger. In 2010, at the request of NASA, the National Research Council (NRC) issued a report entitled "Defending Planet Earth: Near-Earth Object Surveys and Hazard Mitigation Strategies". We have reproduced some of the figures from the NRC report here. This graph shows the current, best estimate of how many asteroids are orbiting, waiting to hit the Earth. The bottom scale shows the size of the objects. The left scale shows how many are that size or larger. 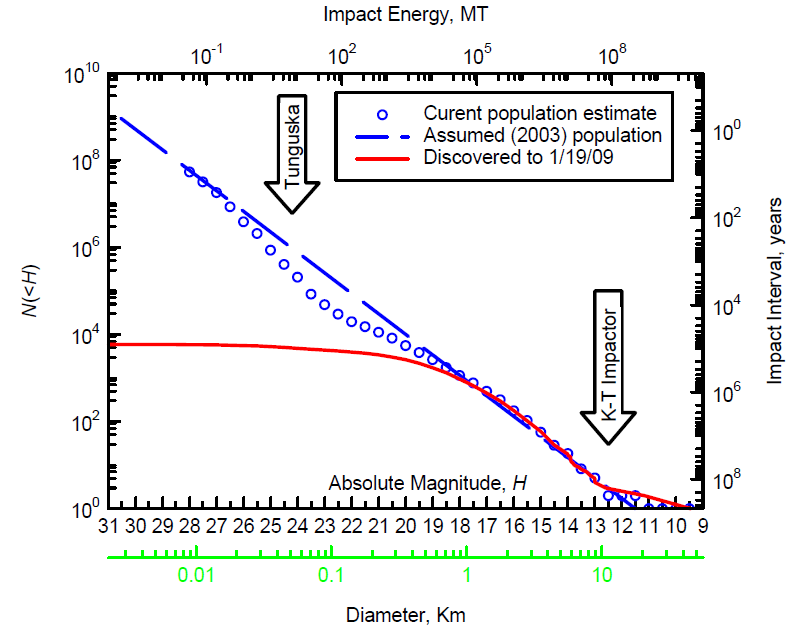 the top scale is the energy that would be released on impact The right scale shows the frequency with which impacts might occur. One big arrow shows the "K-T Impactor" that killed the dinosaurs with an explosion of a million megatons and is expected to happen every 100 million years. The second arrow shows the "Tunguska" explosion of a few megatons and is expected to occur every few hundred years. Technically, this graph shows the number of NEOs, objects whose orbits descend to 1.3 "astronomical unit" (AU, the distance of the Earth from the Sun, approx. 93 million miles). These are potentially dangerous objects because even if they miss us now, their orbits may slowly change from interactions with planets such as Jupiter, pressure from the solar wind, and even collisions. About 20 percent of NEOs are "potentially hazardous objects" (PHOs), meaning they pass within 0.05 AU of the Earth's orbit (600 Earth diameters, close enough that within 100 years their orbits randomly can shift by 0.05 AU). 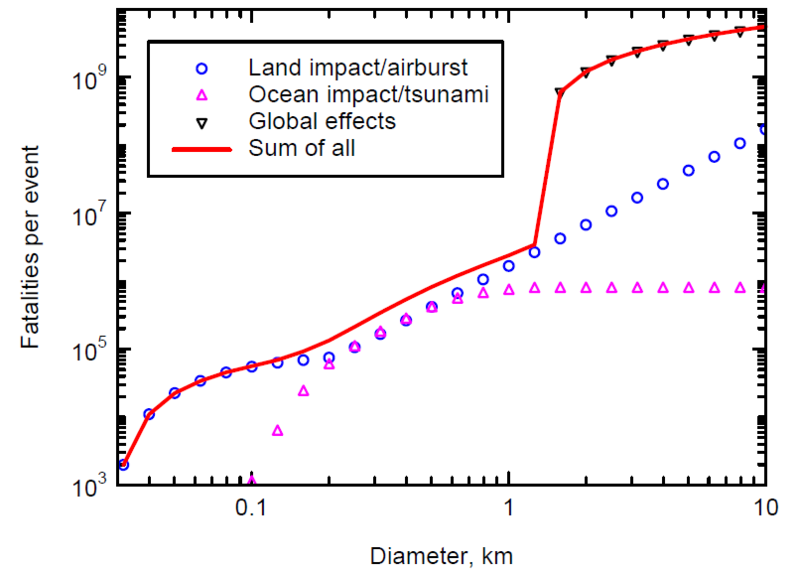 Model of fatalities per event for impacts of various size NEOs. So what is the effect of such an explosion? Earth is protected by a thick atmosphere, the equivalent of 10 meters (30 feet) of seawater. This layer causes small incoming rocks to explode in the atmosphere high above ground and pose no serious threat. These are the meteors or "shooting stars" that we see at night. Asteroid impacts larger than 10 meters (30 feet, 10 kiloton explosion) are much less frequent, arriving once every few years and may sometimes punch down to the ground. The meteor, which exploded above Chelyabinsk, Russia on February 15, 2013, for example, was estimated to be about 15 meters (50 feet) diameter. The explosion in the atmosphere was equivalent to about 440 kilotons TNT. 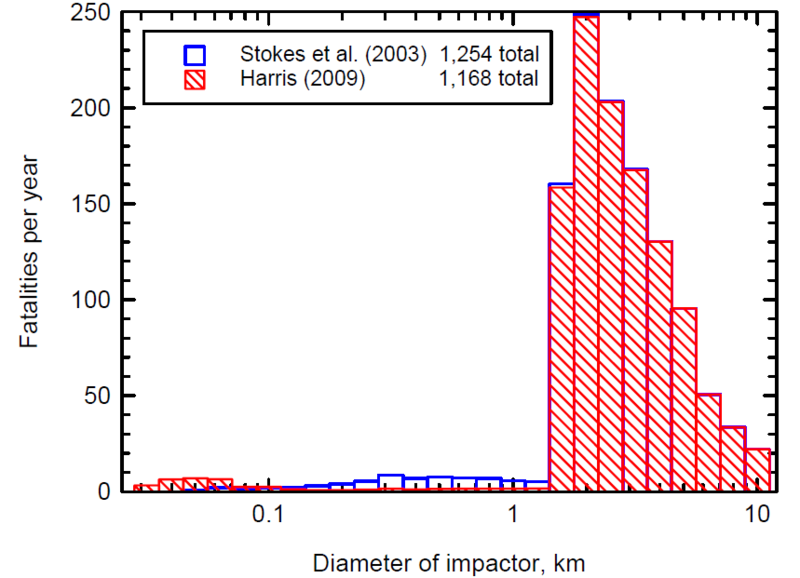 Still larger asteroids are much more dangerous, and the graph (left) shows how the explosion from the impact of a 100-meter (330-feet) diameter asteroid and larger could kill a million people, averaged over all possible impact locations. These deaths could result from a direct hit or by tsunami (tidal wave) in the event of an ocean strike. Scientists predict an asteroid impact of 1-2 kilometers (1-mile) diameter will also cause secondary global damage to the Earth's climate. The vast amount of debris thrown up from the explosion and the subsequent fires will create an "asteroid winter" that might persist for several years, long enough for crop failures to lead to mass starvation. These secondary effects are a hundred times more deadly than the prompt loss of life from the impact. Estimated average fatalities per year for impacts by asteroids of various sizes. With an estimate of how often the Earth is struck by an asteroid and an idea of how many people are killed per impact, we can estimate how many people are killed per year on average. The graph above shows the number of fatalities per year as a function of the size of impactor with the most damage resulting from global catastrophe, amounting to 1,000 deaths per year. We see that the most deadly asteroids have a diameter of a few kilometers, that these explosions occur about once per million years, and that an "asteroid winter" could cause a billion deaths. Impacts do occur at this rate, averaged over the eons, but what about next year or next century? Will we be lucky? New estimated average fatalities per year for impacts by asteroids of various sizes. Since the 1990s, NASA has supported the Spaceguard Survey, an effort to find all NEOs larger than 1 kilometer. The survey's success has led to the discovery of about 85 percent of NEOs that are 1 kilometer in diameter or larger. None is expected to strike Earth in the next century. Thegraph above shows the expectation of fatalities per year, given this new data. (Note the change in the vertical scale from the previous graph.) The risk of global catastrophe in the near future is therefore lower than the average over the eons because we now know that most asteroids in a near-Earth orbit will not strike us any time soon. It is possible, however, that of the 15 percent of undiscovered large NEOs, one might strike Earth but instead of the 1,000 fatalities per year once predicted, the Spaceguard Survey reassures us to expect only 100 fatalities per year. It's hard to improve on surveys such as Spaceguard. Smaller asteroids are dimmer; a 140-meter (500 feet), 100-megaton asteroid is 100 times fainter than a 1.4 kilometer(1-mile) monster that can inflict an "asteroid winter." Also, some asteroids are on " "obnoxious orbits" that are hard to spot from Earth. These include orbits that spend most of their time inside of Earth's orbit; objects that are phased right now to spend most of their time on the opposite side of the Sun; and long period comets that plunge down out of the darkness. Finally, orbits do evolve over time in unpredictable ways from the solar wind and from deflections by close encounters with other objects. The price of security is eternal vigilance.